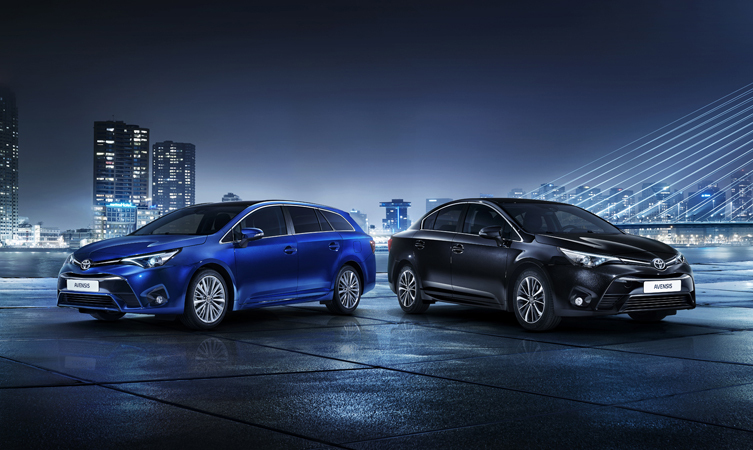 The Toyota Avensis 2015 is a model of firsts. It’s part of the first ‘dual start of production‘ for Toyota Manufacturing UK; one of the first models to benefit from Toyota Safety Sense technology and it’s also the first ever Toyota model to be given what has been referred to as a grammatically interesting ‘big’ minor update! We recently caught up with one of the key people behind the new Avensis, senior project manager Kristof Muylle, to learn more about the car. Toyota Blog: Hi Kristof. 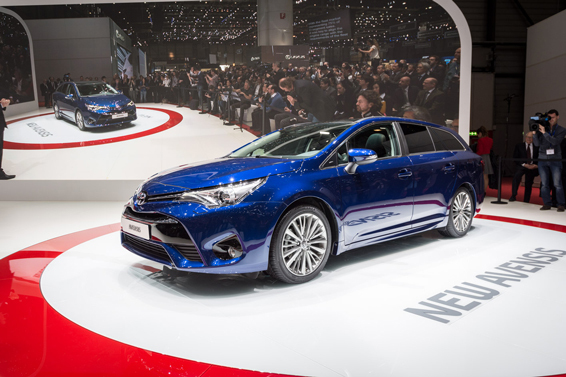 What was the main goal you were aiming for when making the new Avensis? Kristof Muylle: From a target customer point of view, we put a lot of focus on catering for the fleet market and business customers, as we have a lot of potential for growth there. We wanted to make the car more flexible in terms of specification, and have the equipment business buyers require, but then also not forget the private customer and the loyal Avensis owners. Quite early on, we decided we had to re-apply for a five-star Euro NCAP rating as our rating would have expired. The protocol for meeting the rating is now much more stringent than when we first acquired it, so we did a lot of upgrades to reach that point. We’ve increased the safety equipment and upgraded the seat belt systems, the airbag systems and made it better in terms of pedestrian protection. TB: And you now have Toyota Safety Sense as standard in the car. How much of a change is that? KM: It’s great, the pre-crash safety system is really fantastic and will be a great benefit to Avensis drivers, and obviously we hope it will prove to be a selling point for us. Integrating it led us to carrying out a complete upgrade of the electrical systems, so that the various parts such as the navigation, safety systems and the combination meter on the instrument panel can talk to each other better and display information on that combi meter, which is a lot better for the driver. TB: What can you tell us about the new Avensis design? KM: We’re pleased with the new styling, it shows the next generation of what we call the Toyota ‘Keen Look’, and we wanted to make a bold statement at the front. Our decision to improve pedestrian protection to satisfy the Euro NCAP protocol actually gave us a lot of freedom to make changes. So we could create a completely new look. TB: Is that the most important update for the car? KM: Design is important as that’s what creates an initial attraction to the car, but we’ve also improved the quality on interior so that when the customer opens the door they get a premier-feeling interior. We chose new materials, paints and textiles to create a higher level of consistency throughout the car. The new engines are also a good addition to range, the 1.6 diesel is what we call the CO2 champion, it’s a very efficient vehicle – with CO2 from 108g/km – and we’ve tried to reduce the servicing costs by extending the service intervals from 10,000 to 12,500 miles. TB: When did you begin the process of creating the new Avensis? KM: I started on the project in January 2012. This was actually before we had official approval on the project, so we started off looking at the current model to see where the gaps were in terms of market coverage. We took the decision that we actually don’t need a full model change, as by doing what we call a ‘big’ minor change – we know it sounds a bit strange – we can make sure the Avensis remains competitive. In July 2012 we had official approval from Toyota Motor Corporation in Japan to go ahead with this, and from then on we’ve gone through the normal development process to bring this new Avensis to production. TB: What did you do before that? 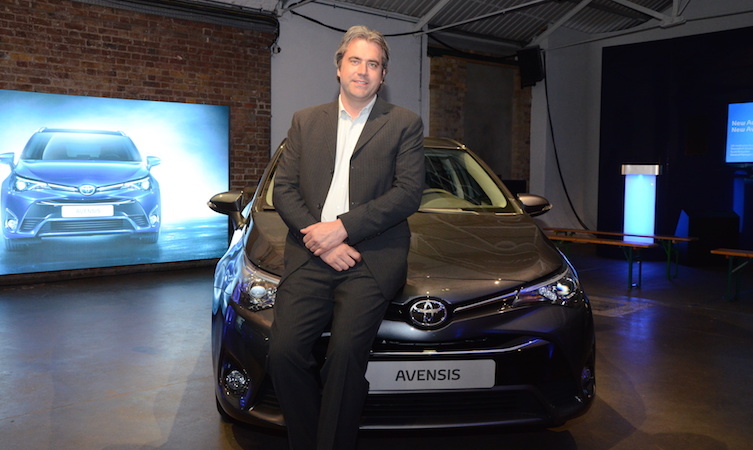 KM: I’ve been working on Avensis since 2008, so I was working on the previous-generation model. I launched that and then moved onto this. TB: How much of the Avensis is new? KM: I would say over 50 per cent. You can see at a glance that front and rear is completely new and in the interior we have a completely new instrument panel, new seats, centre console, door trim… plus new engines and alloy wheels. It’s really an extensive change. TB: The Avensis is only made here in the UK. How closely have you worked with the team at Toyota Manufacturing UK? KM: I am normally based in Toyota Motor Europe in Brussels, but I lived here in the UK for five months from last October, so we’ve been very close. From early on in the process we had really close co-operation with TMUK, and that’s quite a rare thing. Normally our R&D [research and development] team at Toyota Motor Europe builds the first prototype, we evaluate it and when we’re happy we hand it over to the plant, then they start more work on building and refining it. However, what we’ve done in this instance is have TMUK build the prototypes. Their members fed back to our R&D team the issues on building it, and that collaborative process has worked really well. Quite early on in the project we had 20 prototype vehicles, which helped us make decisions on things such as equipment and so on, and change things to make the production process smoother. TB: Do you think this way of working will be adopted on other models? KM: Yes I think so, we’ve already done something similar with TMMF (Toyota Motor Manufacturing UK). Bringing manufacturing closer to design and engineering as early as possible just makes good sense, as they are ultimately the ones creating the vehicles. TB: Where does the Avensis sell best? KM: In the UK, Germany, Poland and some Nordic countries. The UK is one of the bigger markets, so it makes sense to build here. TB: And finally – what do you drive at the moment? KM: I actually have a Toyota RAV4 right now. I’ve been driving Avensis for eight years and the RAV is quite different in terms of the style and spec, so it’s a bit of a change before my new Avensis is ready. Has there been changes to the seating space/legroom, or is that the same as the previous model? Thanks for your post and for your interest in the new Avensis. The seating space and leg room does remain the same as the previous model. If you have any further questions or need any help please let us know. Will the UK version have a sensible speedometer scale? The picture shows a full scale 0-240 km/h. I know that with the Auris a similar km/h scale is used but the software is changed so that mph show BUT on the same scale. If this is the case with the Avensis then the important 30-70 bit of the scale occupies a mere 17% of the whole scale which makes accurate speed readings almost impossible. We will have photo imagery of the new Avensis speedometers for the UK very soon as cars are arriving this week. We will keep you updated with the progress. "Hi Giancarlo, Thanks for getting in touch and for your interest i..."
"Thank you, Syed. We can confirm that the pollen filter needs to b..."
"Hello Ferruh, Thanks for getting in touch. The Hybrid Synergy Dri..."
"Hi Ian, Thanks for getting in touch, it’s great to hear tha..."